BULLET IN THE FACE: A Scattergun Approach To Genre Satire – Schlockmania! Alan Spencer became a cult success during the ’80s with his vigilante cop parody show Sledge Hammer, a send-up of action movie and cop show tropes that is fondly remembered by many. He returned to the same comedic killing field in 2012 with Bullet In The Face, a six-episode series seemingly designed to apply the same satirical mindset to the action/cop tropes that have accumulated since the mid-80s. The results are suitably frenetic and over-the-top… but they’re too erratic in tone and focus to hit their intended satirical marks. 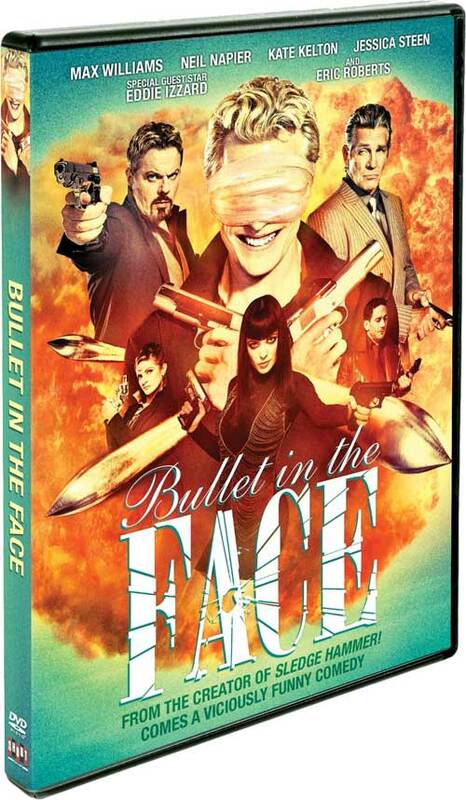 Bullet In The Face offers up an antihero in Gunter Vogler (Max E. Williams), the Eurotrash enforcer of agoraphobic crimelord Tannhauser (Eddie Izzard). He is having affair with fellow Tannhauser-employed criminal Martine (Kate Kelton) – and that leads to Tannhauser ordering Martine to shoot him in the face during a robbery. Gunter survives the assassination attempt but awakens with the face of a heroic cop he shot during the robbery: police Commissioner Braden (Jessica Steen) has him given secret face-transplant surgery so he can be her tool to bring down both Tannhauser and rival crime lord Racken (Eric Roberts). Gunter is sent out into the city with new partner Hagerman (Neil Napier), the ex-partner of the cop he killed, to bring down the underworld… but it should be no surprise that Gunter has a mind of his own about how that should work. That’s a fun setup for a series but Bullet In The Face never quite figures out how to deliver on its potential. For starters, the series turns out to be less about Gunter directly sabotaging the crimelords and more about him romping around the city until Spencer decides to tie all the plot threads up: indeed, the middle 4 episodes of this series deal primarily with “crime of the week” plotlines. They all have some tie to the crime lords but they do little advance the main storyline. What should have been the main plot becomes a subplot. As a result of the “crime of the week” plotting approach, Bullet In The Face also never has time to follow through on a ton of interesting character-driven plot threads that it sets up: the most notable missed opportunities are the unsubtle hints that Hagerman had a gay love affair with the man whose face Gunter now has and the fact that Martine manages to be a moll (using disguises) for both of the city’s crimelords. However, the biggest problem with Bullet In The Face is that it can’t make up its mind what kind of satire it’s going for. Each episode switches up its style multiple times from moment to moment, shifting back and forth between Mel Brooks-style genre satire and a John Waters-inspired transgressiveness. The latter style is the more interesting of the two – one dazzling moment has Gunter encouraging a kid who has committed murder to continue being a killer because the world is full of lies – but the show almost always pulls its punches on that front, going back to a broad goofiness full of groan-inducing wordplay and limp slapstick gags. In short, Bullet In The Face applies a lot of energy to its satirical tasks but is undone by the fact that it never really commits to a single plan of attack and instead tries several at once. The result is strident, with everyone trying really hard to convince you how outrageous the show is, and never as funny as it should have been. DVD Notes: this series recently got a U.S. DVD release courtesy of Shout! Factory. All six of the half-hour episodes fit neatly onto one disc and are presented in an anamorphic transfer that shows off its stylish cinematography. Both 2.0 and 5.1 stereo mixes are provided. The 5.1 mix was listened to for this review and it’s a pretty spacious mix that spreads the music and sound effects around. The one extra is a series of commentary tracks for each episode by creator/writer Alan Spencer. He reveals how the show was born from a rewrite of a failed series, discusses his actors and their techniques with great fondness and contrasts the television network standards of the 80s (when he was making Sledge Hammer) with those of today. The most interesting bits arrive when he reveals the show wasn’t designed to be a parody and discusses how social media has changed how quickly people process entertainment. All the tracks are well-paced and filled with equal amounts of info & schtick.